26 weeks down, 78 weeks to mid-term elections. Here we go! 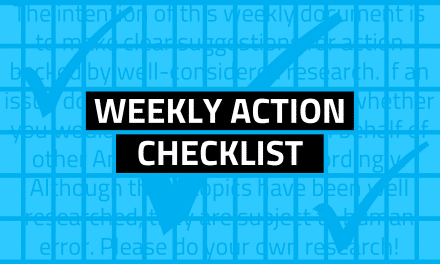 The intention of this weekly document is to make clear, hype-free suggestions for action backed by well-considered research for Americans who care about democracy and justice. Did someone send you here? 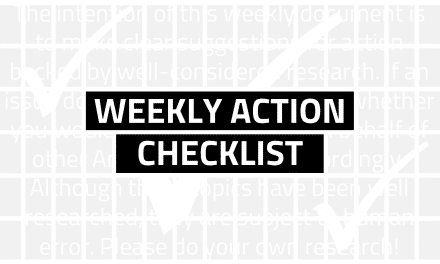 Sign up to receive this weekly checklist. Click if you have a question, correction, or action suggestion. With thanks! Act on your beliefs and values. I believe I can make a difference. Get the worksheet: Plan your activism strategy with my Action Worksheet (or Kelly Wooten’s pocket-sized version). Print one to get started. Get Stance: This app makes calling elected officials easier and less stressful. I believe in equal rights and dignity for all Americans. Action: Oppose church/state conflict in 45’s new executive order. Contact: White House via phone or email. Script: If religious organizations are allowed to endorse and donate to political candidates, they must give up their tax-exempt status and pay taxes like everyone else. This executive order is bad for America and violates our Constitution. Action: Advocate for the dignity of all Americans. Write: Sec. Ben Carson, HUD, 451 7th Street SW, Washington, DC 20410. Script: I am a tax-paying citizen who believes that all people deserve a home that is safe from invasion, elements, and pests, a home with heat and cooling, hot water, clean drinking water, and adequate space to gather, sleep, and prepare food. I am happy to see my tax dollar used to support cozy homes for Americans in need. Ben Carson’s shameful views offend me deeply. I believe in a quality education for America’s youth. Action: Support healthy meals in schools. Write: Sec. Sonny Purdue 1400 Independence Ave. SW, Washington, DC 20250. Script: As a parent (or tax-paying community member), I oppose your plan to make school lunches less healthy. Your priority should be protecting the health of America’s youngest citizens, not the interests of corporate agriculture. I believe in a government led by qualified, trustworthy representatives. Action: Advocate for integrity in leadership. Call: All 3 of your MoCs (lookup or leave message). Script: Hi. I’m a constituent from _ZIP_. I’m concerned about Jared Kushner’s integrity. He didn’t disclose meetings with a foreign bank or ambassador to gain security clearance and is still benefitting financially from his businesses. I would like _NAME_ to join Sen. Warren, Sen. Carper, and Rep. Cummings in asking ethics officials for information about Kushner’s dishonesty and failure to divest. Action: Support an independent investigation of 45’s ties to Russia. Yep. Still. Call: All 3 MoCs. Keep the pressure on (lookup or leave message). Script: Hi. I’m from _ZIP_ and am more concerned than ever about Trump’s ties to Russia. Is _NAME_ willing to join Republicans like John McCain and Darrell Issa and Democrats Nancy Pelosi and Joe Biden in publicly supporting an independent investigation? Action: Advocate for White House visitor transparency. Call: Your two senators (lookup or leave message). I believe in my Constitutional right to free speech. Action: Tell the FCC what you think about the Colbert investigation. Call: (888) 225-5322 or complete their online form. Script: Whether or not it’s polite to talk about 45’s intimate activities, Stephen Colbert’s jokes are still protected free speech under the US Constitution. Americans see clearly what is happening and won’t tolerate censure of Constitutional freedoms of press or speech because of a bruised ego. I believe in quality, affordable healthcare for all Americans. Action: Speak up if your Rep voted for the AHCA bill. Read: See how your rep voted here. Call: Your one representative (lookup or leave message). Script: Hi. I’m a constituent from _ZIP_ and noticed that _NAME_ voted to take away healthcare from 24 million Americans. This is wrong. _NAME’s_ choice on this issue will influence my next vote. Action: Advocate for the kind of healthcare you want. Script: Hi. I’m a constituent from _ZIP_ and am aware the Senate will soon be editing the AHCA bill. I am happy for my tax dollar to support healthcare for myself and all Americans. Specifically, I want… (list). Thank you. Action: Praise 45 for his admiration of the single-payer system. Read: All the times he’s publicly supported it. Script: Your idea that America should have universal health care is great. If you made that deal happen, the media would respect you, and all Americans would admire you. It’s a great system. Name, State. Note: Keep it clean. He will only listen if feedback is 100% positive. Deep breath innnnnnn… Deep breath ouuuuuuuut… Two more. I believe in creating a healthy planet for future generations. Action: Make a statement to the EPA by May 15, 2017. The EPA is soliciting public comment on repealing EPA regulations. Visit: Regulations.gov. Click the dark blue “Comment Now!” button, upper right. Script: Share why you support protections for clean air, soil, and water. I believe in being a good citizen of the world. Action: Support advocacy for asylum seekers. US border agents are illegally turning away asylum seekers at the border. Help advocate for their legal rights. Donate: To Human Rights First which advocates for the most vulnerable. Read: HRF’s recent report on the treatment of asylum seekers. Thank Rep. Ileana Ros-Lehtinen (R-FL) for publicly opposing the revised ACHA plan, that would “severely harm the health and lives” of her constituents. Putting people over party makes a great leader. Thank your own representative for voting to keep the ACA, especially if they are among the 20 Republicans who did. Share why this is meaningful to you, personally. Thank Rep. Tom MacArthur (R-NJ) for recognizing that Congress should have the same healthcare options as all other Americans, not special privileges. Proposing legislation that ensures equal treatment is good leadership. Thank Bill Shuster (R-PA), House Transportation Committee Chairman, for holding airlines accountable for their treatment of passengers, insisting on improved systems. Thank Sen. Marco Rubio (R-FL) for publicly condemning the ongoing persecution of gay men in Chechnya, and Russia’s tacit enabling of such abuses. Thank you for speaking up against tyranny and advocating for the voiceless. If you’re upset about the AHCA passing the House, here is a much-needed pep talk. 7 weird financial trends since 45 became president. The first 100 days have been bad for the planet. Excellent perspective and information for heavy hearts. Why it’s hard to talk to people who disagree with you. Please take good care of yourself and get enough sleep. When we’re rested, we will win. We opposed cultural appropriation and won. The Oregon Country Fair board had a change of heart, wrote a remarkable statement, and will not be raising the “story pole” in June. Thank you for advocating for respect of Native people, culture, and voices. Congress’ continuation budget, good through September, retains funding to Planned Parenthood, the Corporation for Public Broadcasting, and the National Endowment for the Arts. It does not fund 45’s wall. The final version of 45’s “religious freedom” executive order did not include discrimination against LGBT people or unwed mothers. Democrats sing to GOP after the House voted approve the AHCA bill (hat tip POPVOX). Senate GOP doesn’t love the House’s AHCA bill. Expect major changes. Even health insurance companies don’t support the American Health Care Act. Rep. Sean Patrick Maloney (D-NY) suggests Dem congresswo/men attend town halls to explain health care bill if GOPs no-show. Texas law enforcement opposes a law that forces collaboration with ICE. A Texas judge fines Exxon Mobil $19.9M for polluting. 54% more Democrats will be running for Congress in 2018. Democrats are using the tax overhaul process to shed light on 45’s own taxes. More DAPL cases are dismissed. Georgia residents now have 2 additional months to register to vote in run-off election between Ossoff and Handel. Together, a judge and former drug dealer work to reform minimum sentencing laws. 82 kidnapped Nigerian girls have been released by Boko Haram. A teen Girl Scout faces down a neo-Nazi in the Czech Republic. CA teens create an anti-suicide program called 13 Reasons Why Not in memory of their classmate. Even more good news here at this website full of weekly celebrations. If you’d like to receive this message weekly, sign up here. 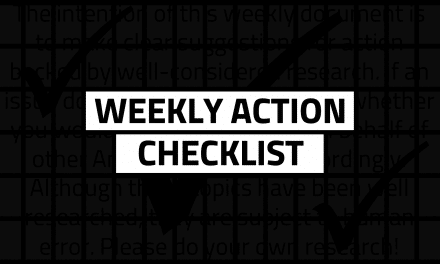 To see archives of past Action Checklists, click here and scroll to the bottom. Like this checklist? Support the writer (patreon) or contribute (paypal). Please keep taking good care of yourself and rest when you need to. We’re stronger together! 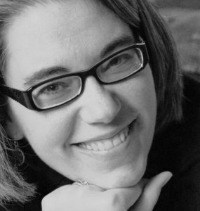 Jennifer is a writer of blogs and a teacher of social media for small business. As a Gen Xer, she's old enough to remember the Reagan 80s, but young enough to be comfortable using social media. In college, her first vote went to Bill Clinton. She wore a pantsuit when I voted for Hillary, and is proud to live in the great state Oregon, and of her Yankee heritage as a Connecticut native.